This past week I did the “Love Your Spouse” challenge on Facebook. The challenge was to post a picture of your spouse on Facebook every day for seven days and tag two people to keep it going. I may have tagged a few people throughout the week, but not two every day. I’ll admit, I don’t usually do things like this. I find them to be a little obnoxious, but also kind of neat, but again, obnoxious, so I feel bad doing them, usually. However, I’m always up for sharing pictures of my awesome husband, so I went with it and did the challenge, and I’ve decided that you all should get to see what I shared too. Here’s a weeks worth of obnoxious loving on my husband. This was the first picture ever taken of us together as a couple. 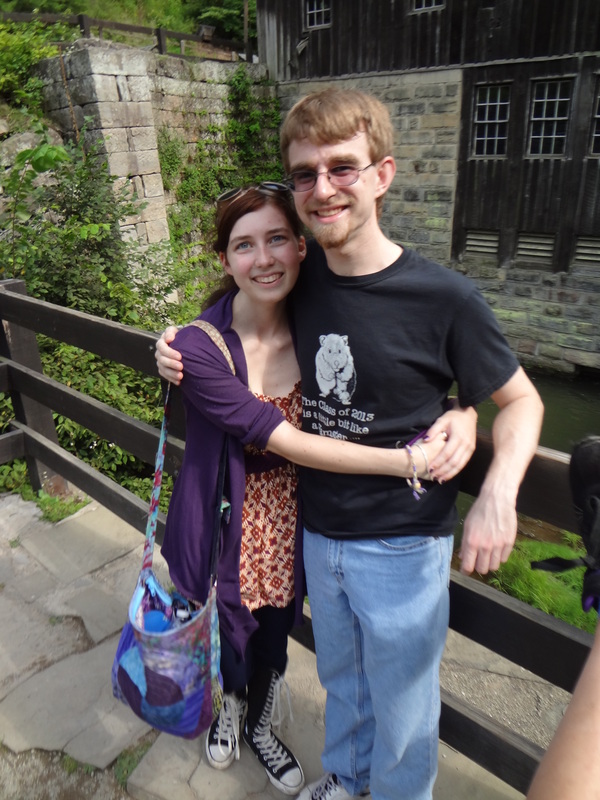 We went to McConnell’s Mills with my sister and his two sisters and had a very awkward time of it. I thought it would be fun, Erin could get to know Logan and I could get to know Lauren and Molly. It didn’t quite go that way, but I think we still managed to have some fun along the way. I specifically made my sister take this picture because we didn’t have one until then and I really wanted a picture of us for my profile picture. Once it was up, though, he too wanted it for his profile picture, so we were that matching couple for a little while, which is super weird when you’re having a conversation in Facebook Messenger and the other person has the same picture as you. It’s kind of like talking to yourself. Anyway, I thought it was fitting for the first day to do our first picture together. It’s a little cheesy, but it has a special place in my heart. For day two I chose this one from our first engagement shoot with my good friend Natalie Donnan. She was kind enough to offer her photography skills as a gift for our engagement photos and she did a really lovely job! This one is Logan’s favorite. For Christmas that year he had it large printed on canvas for me. It was hanging in our old apartment, but I have yet to find a suitable place for it in the new house. I’m working on it. It was one of those super natural pictures, you know? The ones where you’re not doing anything in particular and they just turn out right? Natalie told us to just walk and we were walking and Logan made some joke and I did one of my obnoxious laughs and Natalie snapped a picture and here it is. I love it because it captured a very us moment. For day three I was at my in-laws for the evening and wanted a quick one that I didn’t have to talk about a lot. I knew a wedding picture had to be in there somewhere so I figured it after the engagement picture, why not? I knew I wanted one that wasn’t posed, one from the wedding itself or perhaps from the reception taken by a friend at a random moment. I went with this one because it’s one of Logan’s favorite pictures from our wedding. It happens to look very similar to a picture from his parents’ wedding where they’re also coming down the aisle. It’s a really nice parallel as we are basically them in young couple form. I like this picture because it’s such a genuinely happy moment. Not that the other pictures aren’t actually happy, but there’s this sense of “smile for the camera” about the posed pictures that this picture does have. Much like the engagement picture we’re just happy to be together, happy that we just got married, and happy that it’s all that much closer to being over. To follow up the wedding picture I wanted to pick one from our first year of marriage. There were lots to choose from, but as I was going through the pictures of us on Facebook I saw this one and had to share it. This is from our first Christmas season as a married couple. Every year Logan’s family goes to downtown Pittsburgh for a day to enjoy the Christmas village set up there. I joined them first the year we were engaged, and thought about sharing the picture of us from that, but I kind of like this one better. It’s a candid shot by my sister-in-law, Lauren, while we were laughing about something dumb, probably. It was actually cold that year, too, as opposed to the other years I’ve gone when it’s been raining. 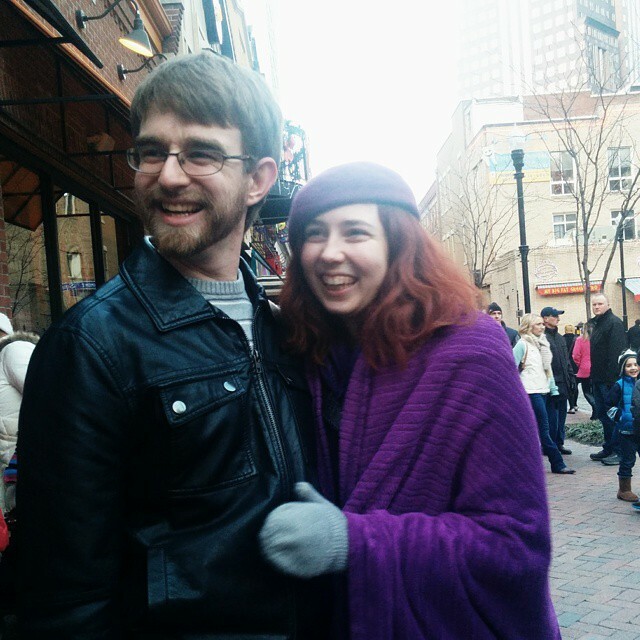 That year we were all bundled up and may have been about to get hot beverages. What I love most about this picture is Logan’s face. He has this great laugh and I love the look of it in his smile. I love that he’s wearing a sweater, because I love him in sweaters, and he mostly wears them for me. He hates sleeves. I also love him in that leather jacket. I even kind of love his floppy hair, even though he hates that too. This is one of my most favorite pictures of all time. 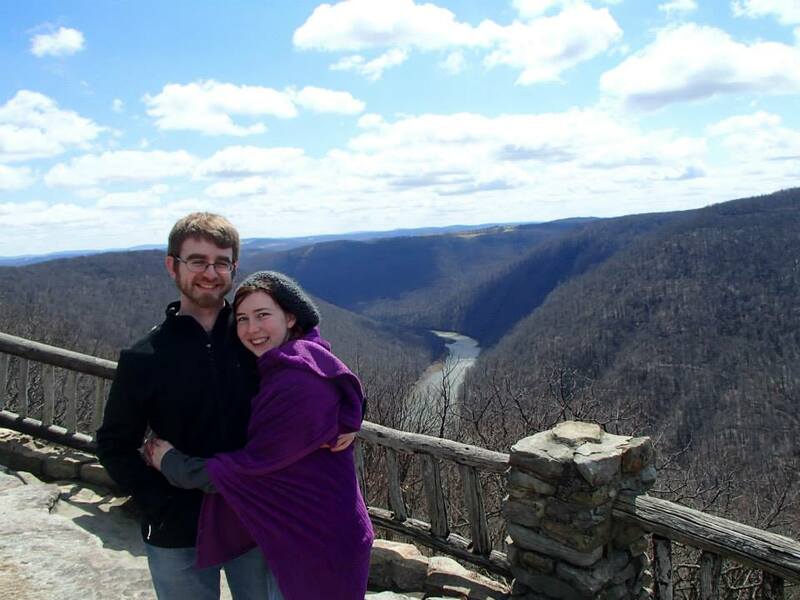 It was taken during a climbing/hiking trip we went on for a friend’s birthday the spring after we got married. We went out to Cooper’s Rock and did a little bit of bouldering in the morning and then took a break for lunch on this over look. It was a beautiful view and our friend offered to get a picture of us before we moved on to hiking. Of course I made Logan stand for a picture, how could I resist? The picture turned out beautifully and the day was a lot of fun, despite being a little chilly. And yes, I did go hiking with that blanket on. I did not take it off. I love this picture partially for the view and partially because Logan has his picture grin on. He feels super awkward taking pictures so sometimes he tries this smile or sometimes he just kisses my cheek or forehead so he doesn’t have to look at the camera. I think the smile is super cute, though. I knew when I started that I would have to share one of these, it just took me forever to figure out which one. I love this picture so much. It’s hanging on the wall behind me right now. It’s the biggest one. 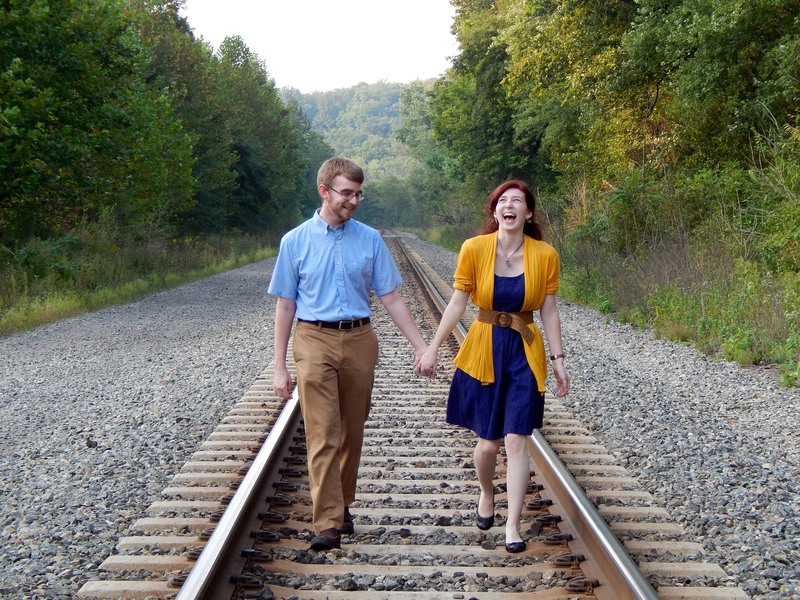 This is from our first anniversary shoot that we waited until the fall to have. 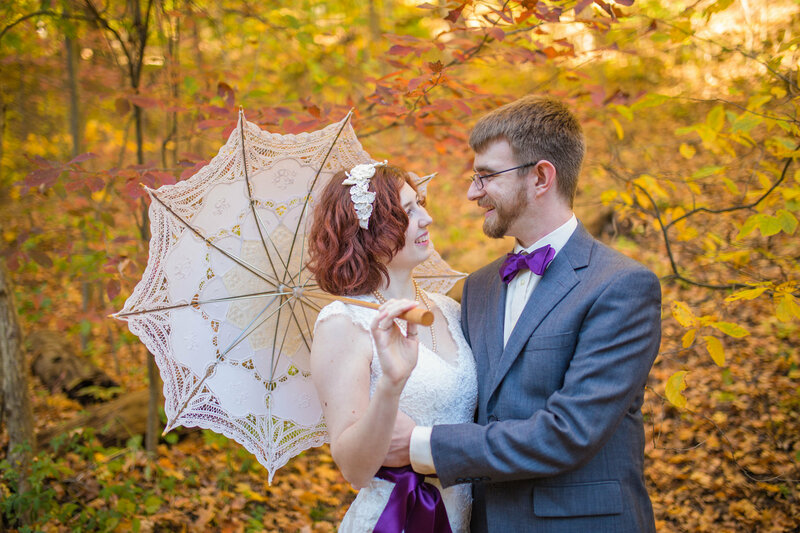 I always wanted a fall wedding, but I didn’t want to wait for a fall wedding and Logan didn’t want to wait for a fall wedding, so we had a summer wedding instead. I never understood why my parents didn’t wait until I got engaged. I am basically my mother. Anyway, since we didn’t get to have a fall wedding the next best thing, I figured, was to have a fall wedding shoot and for our first anniversary my dear friend Lindsey (now Hollabaugh) Zern of Lindsey Zern Photography agreed to do a photo shoot with us so we could get all the fun leafy photos that I had wanted. And my wonderful husband agreed to do it with me, just to make me happy. He even got all dressed up again in his wedding suit. For the final day of my “Love your spouse” challenge, I knew I wanted one taken this year. I thought about doing one of just Logan instead of one of both of us. There are so many pictures of him that I love a lot and I’m almost tempted to do the whole thing over with just pictures of him. The challenge never said it had to be of both of us, after all, that’s just what everyone was doing for it. But then I saw this one as I was browsing hing pictures and I had to choose it. It’s kind of a wonky picture, sure. The lighting is weird and it’s from Instagram so it probably has a filter on it, but I like it. It’s from one of the few trips we’ve taken this year that haven’t been super stressy and rushed. We went out to visit Lauren at college in Winona Lake, Indiana so we could see her senior art show. I’d never been out and Logan had never gotten to visit her so it was pretty exciting for us. We walked around the little village on the lake and saw all of Lauren’s school and class rooms and stuff. 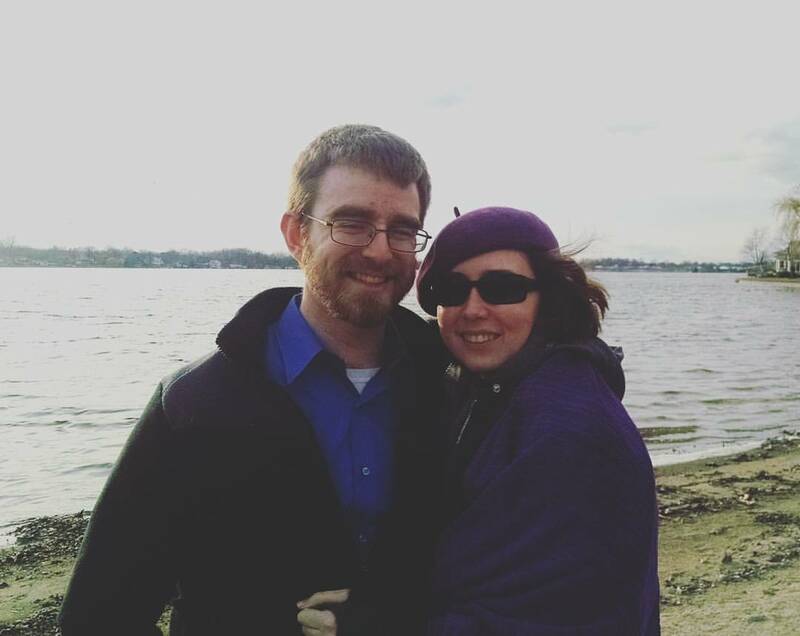 It was in March, so still cold, but we had a nice time, and the lake was still very pretty, even in the chilly air. So that’s the seven days of obnoxious spousal love that I shared with Facebook this past week. I enjoyed going through all the old pictures of us. I always love looking at pictures and the ones of me and Logan together are my favorites. There are a lot of other pictures I would have liked to share, I think. There’s a really nice one of us shortly after we got engaged that I love, and some selfies that I’ve made him take with me that are rather cute, but these are the ones that I chose and I’m happy with them. I hope you enjoyed this sappy post. I didn’t get to actually do a second anniversary post so this makes up for it. If you’re into this sort of thing, I encourage you to do the challenge whether you were tagged in one or not. It’s fun and you shouldn’t need an excuse to show your spouse some love. Just do it! And have a lovely day, my friends.